I love that game too!! I love it!! Well I did take a small nap while reading my new Kindle! 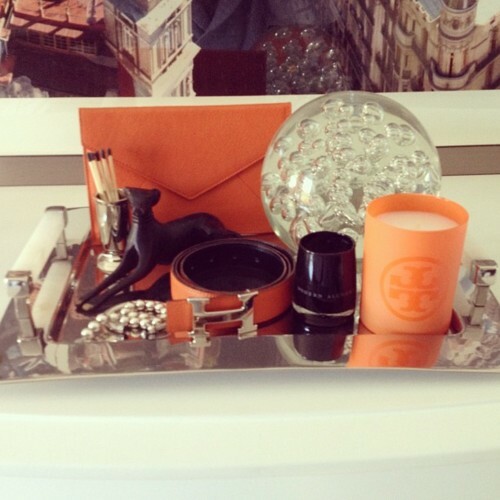 I also am using some wonderful orange accessories.in my decor. All of the orange is fabulous!!! This looks awesome. So nice to meet you just found your beautiful blog and so happy I did. I have enjoyed looking around and I'm now following you, wonderful to meet new friends. Hope you find a spare minute to visit and follow me sometime if you like. Sending you special wishes for a wonderful New Year I’m looking forward to keeping in touch in 2012. Looks like you've caught orange-fever too - check out my juicy post here! Just gorgeous! I love the idea of displaying matches! Hope you are having a wonderful Sunday! I am so all over your crazy beautiful vignettes!! Gorgeous. I wish I thought of things in that way. That's a whole lot of amazingness all in one spot.. Gorge! The orange is gorgeous...love your game too!! Me too! Side tables are my favorite. It helps things feel fresh. love the orange and black Erica! so luxe and stylish! I love, love, love the orange! Maybe that should be my new hobby! 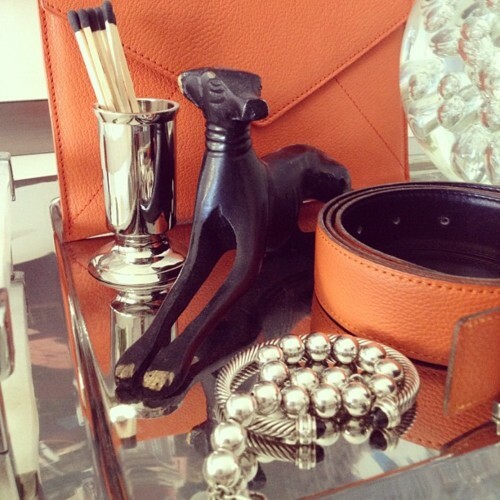 Love you orange and black vignette - look very glamorous! i adore the orange envelope, may i ask where this is from? i've fallen in love with your style! Wow this vignette looks so great!! I am so bad at doing these, but I will use your pic for inspiration!! It is fun, isn't it? These vignettes are beautiful. Love the orange! And yours is beautiful...love the orange!! Beautiful! I love me some orange. Combine that with Tory Burch candle and Hermes belt and its perfection! I'm a new follower and have only been over several times but I think without a doubt that you are the best at vignettes that I have ever seen on blogland. For real!